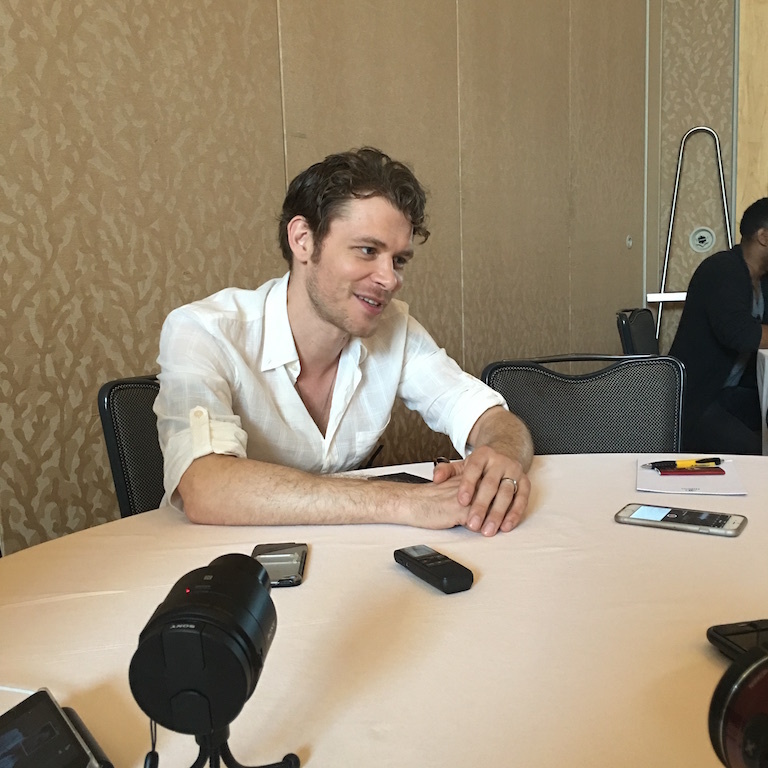 We talked to Joseph Morgan at SDCC last month about the Mikaelson Family, Hope, Klaroline, and what fans can expect in The Originals Season 4! I remember the first time I ever heard about Klaus Mikaelson. Anyway, I remember reading in the first book, The Awakening, about how Klaus, the Old One, was Katherine’s (Elena’s doppelgänger) sire and mentor. And then, in book 4 (Dark Reunion) we actually meet Klaus, who is the major bad guy. Of course, then The Vampire Diaries was adapted into a TV show that was everything! When writers announced that the character Klaus would join the show’s second season, I was extremely excited. Since that time, I’ve been so impressed with how the writers have taken a previously small character and built Klaus and the Mikaelsons into so much more. The interest in the Mikaelson family spurred The Originals spinoff which is a phenomenal show, too! But in terms of Klaus himself, how has it been possible to take this horribly violent and conniving vampire (or so we thought) and turn him into a powerfully compelling and sympathetic character? We certainly owe this, in part, to the amazing Joseph Morgan. Over the course of three seasons, JoMo has portrayed Klaus’ struggles with family, face-offs with (fr)enemies, and becoming a father. Throughout The Originals, I’ve despised Klaus, been totally horrified by him, but I’ve also been heartbroken for him and felt enormous pride. For me, this is most typified by Klaus’ sacrifice at the end of Season 3 to save his family by giving himself over to Marcel, who stabs him with Papa Tunde’s blade and locks him behind a wall of bricks in the Garden. When Klaus is freed (because you know he will), what is next for him? Will he reconcile with Hope and his family? Last month during Comic-Con I asked JoMo these questions and more! Watch our interviews below. So, what can you tell us about Season 4? What will Klaus’ state of mind be when awakens? We know that when The Originals returns, we will have moved five years into the future. According to JoMo, when we first see Klaus, he will be very angry, but keeping his emotions very close to his chest. Yet, he’ll definitely be thinking about how to finish off his enemies, which, for now, includes Marcel. Given all of Klaus’ experiences over the last 1,000 years, when do you think he’s been the most happy? What would it take to get back to that? JoMo says that Klaus’ daughter, Hope, is central to the character’s happiness. Klaus has been overwhelmed with becoming a father, and the most happy moment for is probably at the end of Season 2 when he’s telling Hope a bedtime story about a King and his little princess. To reclaim that happiness, JoMo says Klaus would want to reestablish a relationship with Hope, but after five years, that might not be possible. Will Hope, now a little lady, be interested in knowing her father? Klaus is very nervous about this. FYI, if you haven’t heard, TVLine introduced us to the actress playing Young Hope, Summer Fontana. Tell us true, do you think there’s still potential for a Klaroline romance? In all honesty, JoMo says he doesn’t know where writers plan to take the Klaroline relationship. But he’s so impressed with fans’ devotion to that ship! Our new friends at Pure Fandom piggy-back on our question and ask JoMo if he knows that the Klaroline phone call from TVD Season 7, Episode 14 has won the EOnline “Best Shocker” award. JoMo thanks fans and then talks about filming that phone call and wanting to do it justice because he knows how much fans love Klaroline. The Mikaelsons are so devoted to their family above all else. Are they worth saving? JoMo says that, after all these years, the Mikaelsons really only have their commitment to the defense of family. And given all the terrible things they’ve gone in the name of family (e.g. Davina’s death), the Mikaelsons have to believe it’s all been worth it. Well JoMo, we’ll be with Klaus and the Mikaelsons right until the end… hopefully it doesn’t come too soon though! What did you think of the interview? What are you most looking forward to in The Originals Season 4? Share your thoughts in comments! The Originals returns in 2017 on The CW.